NO MATTER how you pronounce it, Gala is among the very best sweet apples. 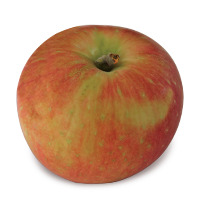 It has more character and nuance than most sweet varieties, with outstanding apple and pear flavor. Gala is juicy, and it is good for both fresh eating and cooking. Gala’s skin changes color from harvest to storage, often beginning with streaks of yellow on a red background, gradually intensifying to a deeper red, with hints of orange, as the season wears on. Gala has complex parentage. 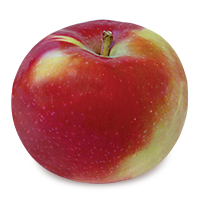 It conical shape and some of its sweetness comes from Red Delicious and Golden Delicious. 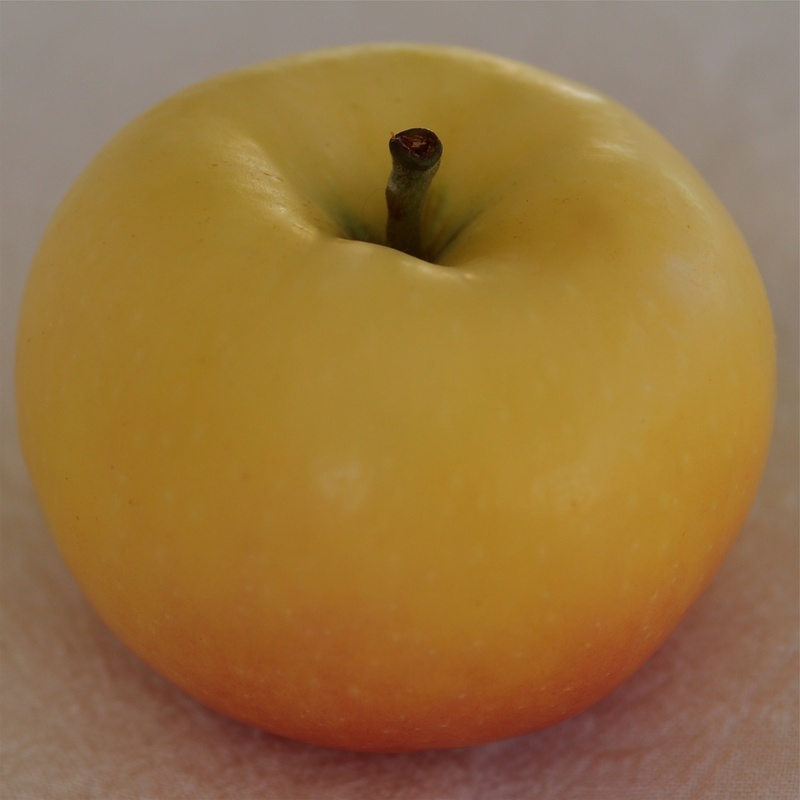 Golden Delicious also supplies some of its early season color. Two other Gala parents have orange in their name: the English heirloom Cox’s Orange Pippin, and Kidd’s Orange Red, an apple from New Zealand. Even the name fits the apple, compact, short and sweet. Biting into a Gala is, as Merriam-Webster defines the word, a festive celebration. Both pronunciations, incidentally, with either a long or short first “a,” are considered correct. Gala was discovered in New Zealand in 1934, and introduced commercially in 1970. 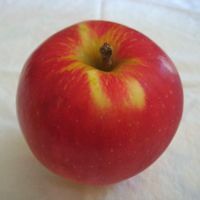 It was one of seven major commercial apple varieties released in the United States between 1962 and 1970, the others with similarly succinct names: Fuji (1962) and Akane (1970) from Japan, Empire (1966) and Jonagold (1968) from New York, PaulaRed from Michigan (1968), and Ginger Gold from West Virginia (1969). THIS FRIDAY, September 18, marks the opening of the 2015 Eastern States Exposition (“The Big E”), the region’s largest fair, which draws about 1.5 million people during its 17-day run. 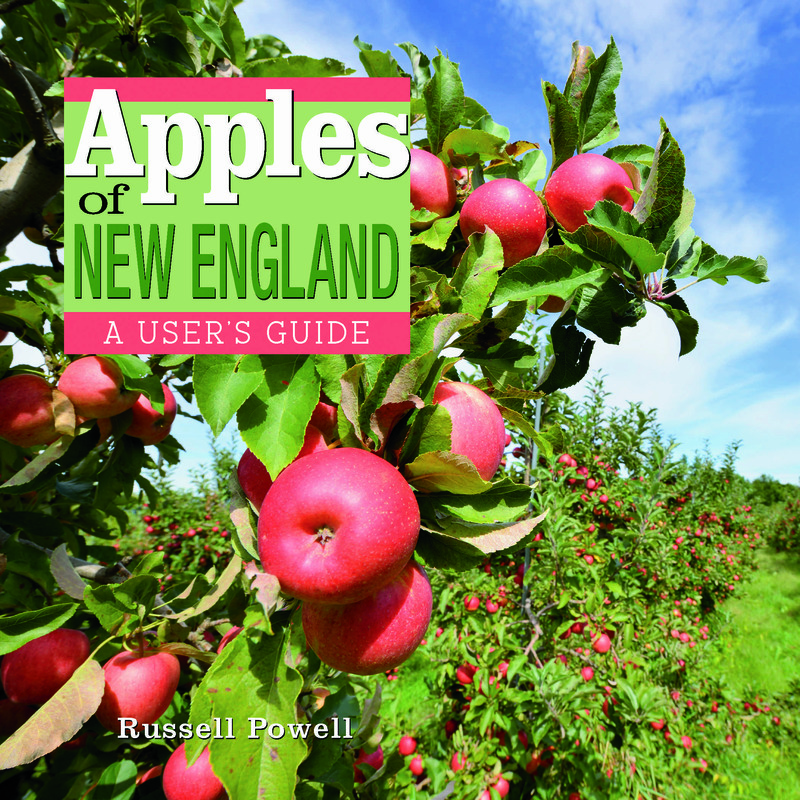 The New England Apple Association booth, in the rear of the Massachusetts Building, will once again feature a variety of fresh apples, baked goods, fresh cider, and literature about the region’s orchards. The fair runs daily through Sunday, October 4. 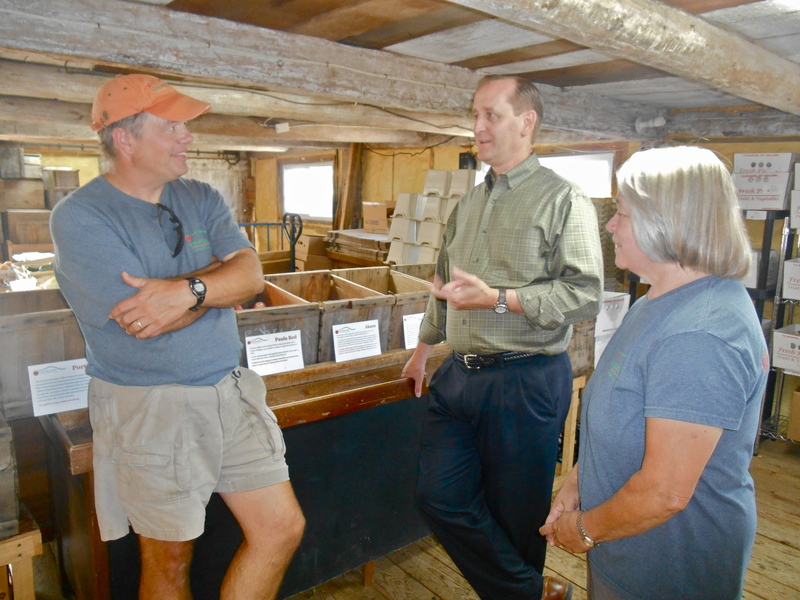 Hours are 10 a.m. to 9 p.m.
We will have fresh cider from Carlson Orchards in Harvard, cider donuts from Atkins Farm in Amherst, and fresh apples this weekend from Carlson Orchards, Clarkdale Fruit Farms in Deerfield, and Nestrovich Fruit Farm, 561 Main Rd., Granville. We will also have apple crisp and apple pie! 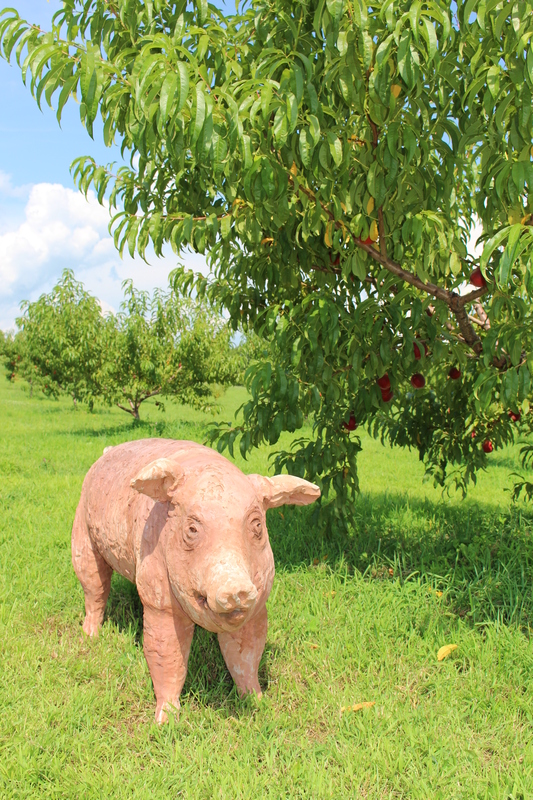 If you are not out visiting an orchard, please stop by! MANY PEOPLE, and some orchards and supermarkets we have visited, want to stick an “a” between the capital “M” and small “c” of McIntosh. It does not exist. A macintosh (or more commonly, mackintosh) is a raincoat, or the brand name of a personal computer. A McIntosh is an apple. Outside of the region, a Mac might evoke images of a computer or a hamburger. In New England, a Mac is an iconic fruit. 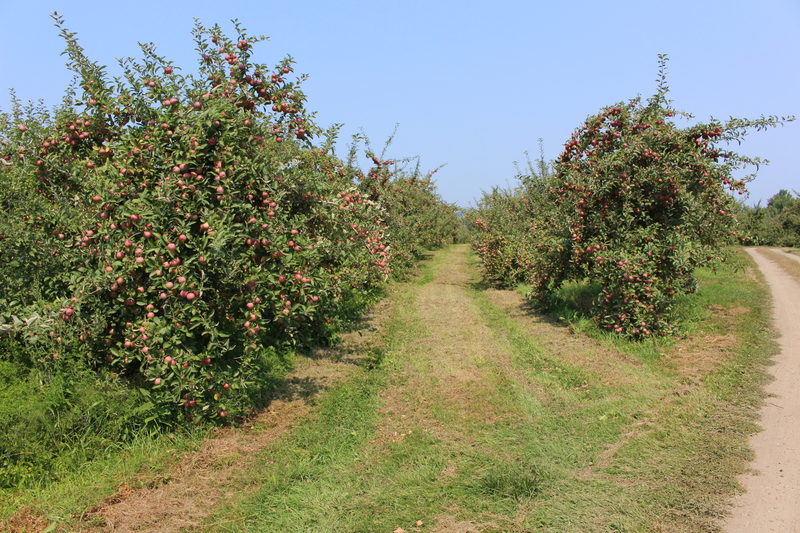 The apple named for its founder, Canadian farmer John McIntosh, has flourished in New England for the past century. 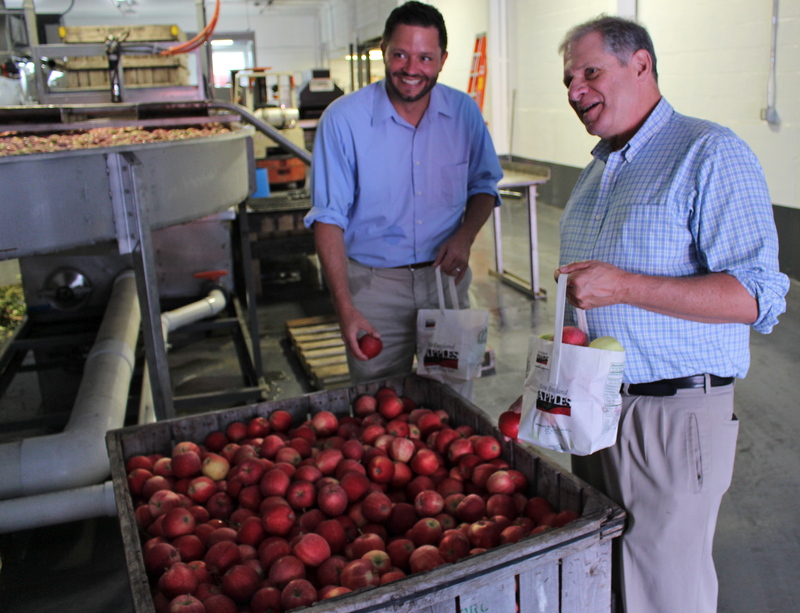 McIntosh is the region’s leading apple, accounting for about two-thirds of the New England crop. McIntosh is particularly well-suited to New England’s rocky soils and cool summer nights. 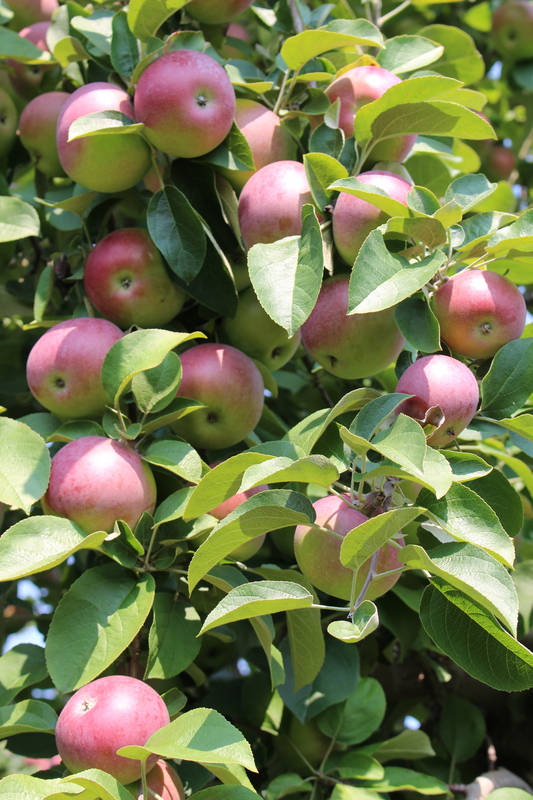 It cannot be grown successfully in the South or West, requiring not just the right soil but the cool nights that help the apple develop its distinctive flavor and color. 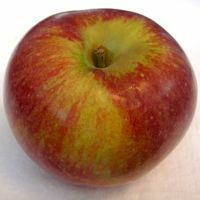 The round, red-and-green apple with a heady aroma, plenty of juice, and outstanding sweet-tart taste, has other qualities that limit its spread beyond New England. McIntosh does not travel as well as many of the hard apples imported here from other parts of the country, due to its thin skin. More problematic for some is McIntosh’s color. While most New Englanders admire the apple’s random splashes of red and green, the marketplace demands purer color. 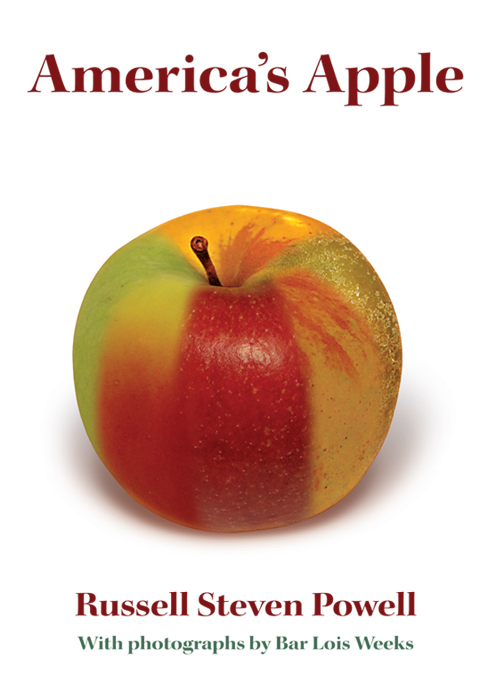 Apple breeders are continually trying to develop redder and redder strains of McIntosh. 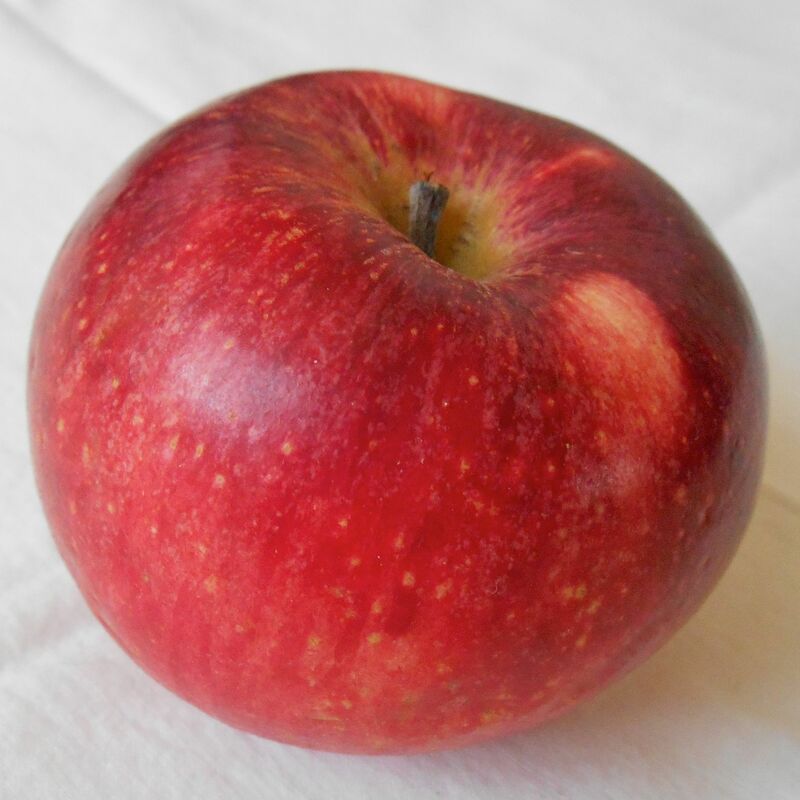 Among the many newer versions of the apple featuring greater red color are Marshall McIntosh, discovered on a farm in Fitchburg, Massachusetts; Pioneer McIntosh, and RubyMac. 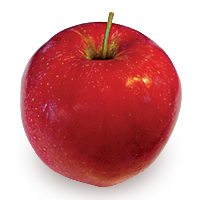 Apart from these redder versions of the original, McIntosh’s influence can be felt throughout the apple world, as a parent of such varieties as Cortland, Empire, and Macoun. 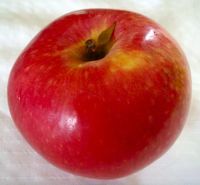 Although John McIntosh discovered the apple in 1801 as a chance seedling, its parents are generally accepted to be Fameuse, or Snow apple, and the heirloom Detroit Red. It took nearly 70 years for McIntosh’s son to introduce the apple commercially. Vermonter Dr. Thomas H. Hopkins is credited with planting the first Mac in the United States, in 1868. McIntosh’s popularity grew steadily over the next half century, and it was being planted extensively in New England by 1910. 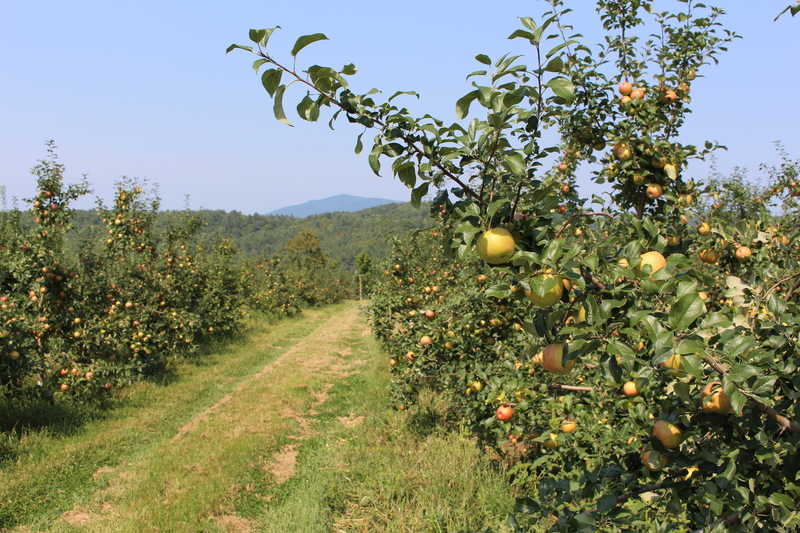 Its ascendancy as the region’s leading apple was hastened by the extreme winter of 1933-34, which wiped out most of New England’s Baldwin trees, plus many Gravensteins, among others. 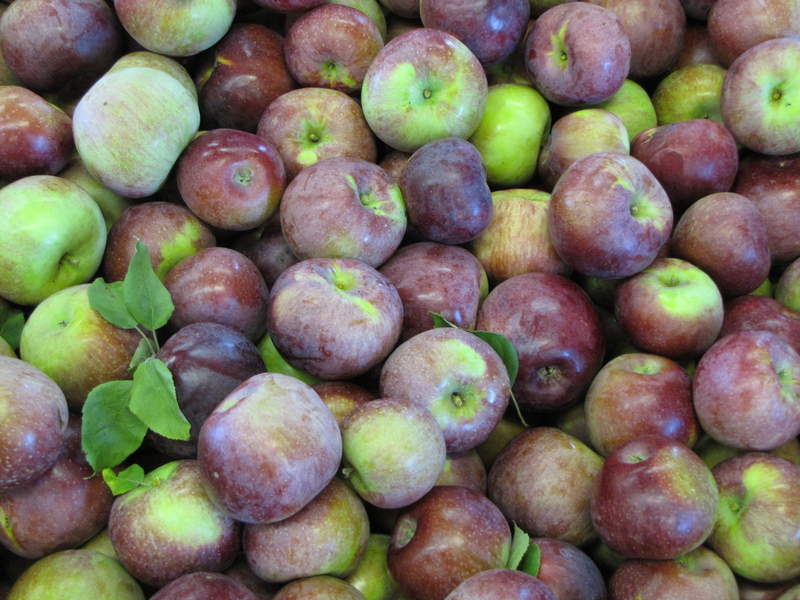 The hardy apple from Canada not only survived, it thrived in New England. The hardiness of its trees, though, fails to account for McIntosh’s enduring popularity. It has become an iconic symbol of the New England fall, a way to usher in the season with a ritual first bite. 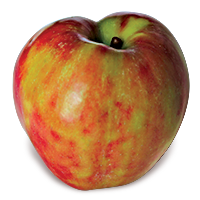 As a fresh eating apple, McIntosh has a distinctive crunch to go with its rich perfume and strong flavor, and it is excellent in cider and for baking. McIntosh tend to break down when cooked, making it an outstanding choice in applesauce. 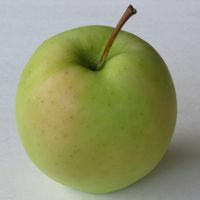 Most bakers are willing to sacrifice a little firmness in their apple pies in order to include some of McIntosh’s flavor and aroma, mixing them with firmer varieties like Cortland or Mutsu. Many people are so in love with McIntosh’s flavor that they are willing to risk a softer pie. But the days of the soft fresh McIntosh are long gone, or should be. 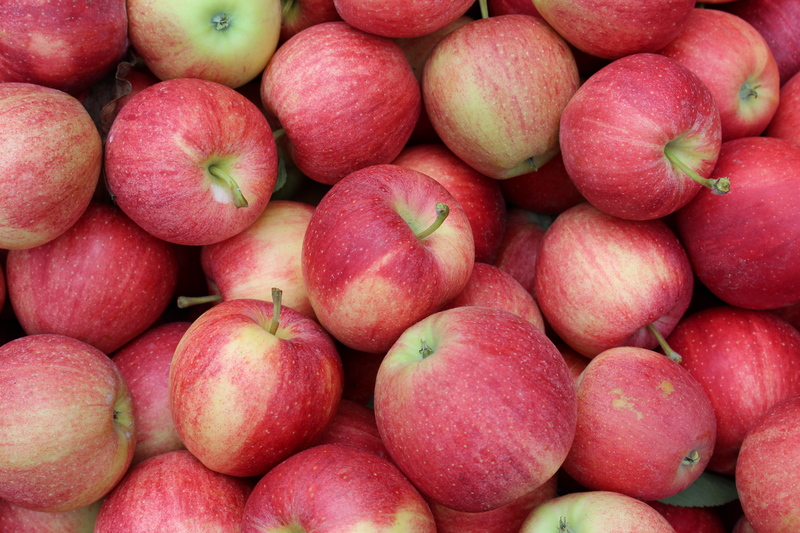 The advent of controlled atmosphere (CA) storage, a method of arresting apples’ respiration by placing them in a sealed room with most of the oxygen removed and carbon dioxide added, keeps McIntosh crisp months after they are harvested. All apples should be kept cold to retain their crispness, and this is particularly true of Macs, which can soften if left at room temperatures for too long. If you get a soft McIntosh these days, chances are that it was not kept cold somewhere along the chain from orchard to consumer. It is high season for McIntosh. 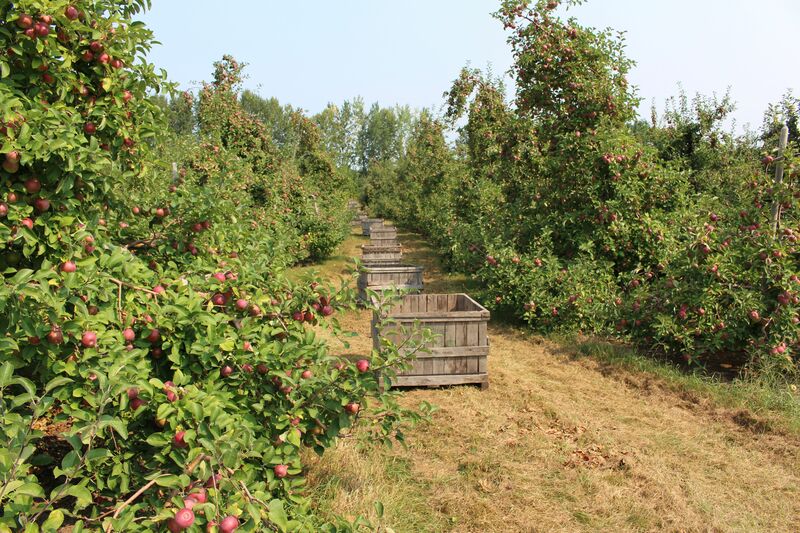 Most of the region’s orchards will be picking, packing, and selling them this weekend. If you haven’t had your first one yet, it is time to get started. If you are one of those rare individuals who has yet to try McIntosh, be prepared for a richly complex experience. 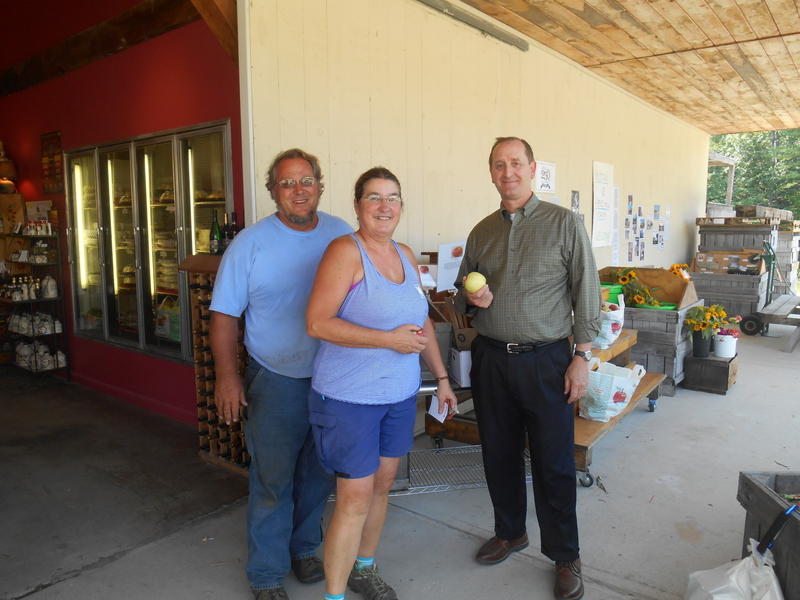 BROOKFIELD ORCHARD’S Annual Harvest Craft Fair will be Saturday, September 12, from 10 a.m. to 4 p.m., rain or shine. 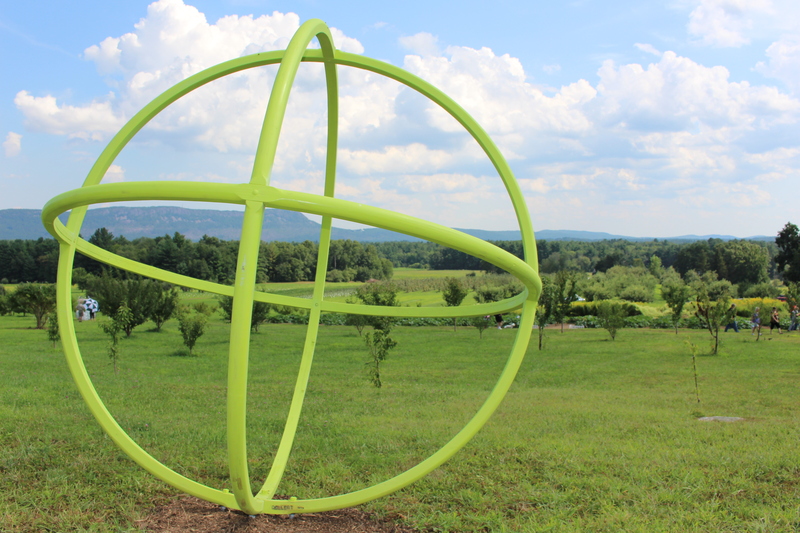 The orchard will have pick-your-own apples, apple dumplings, cider donuts, and a snack bar. 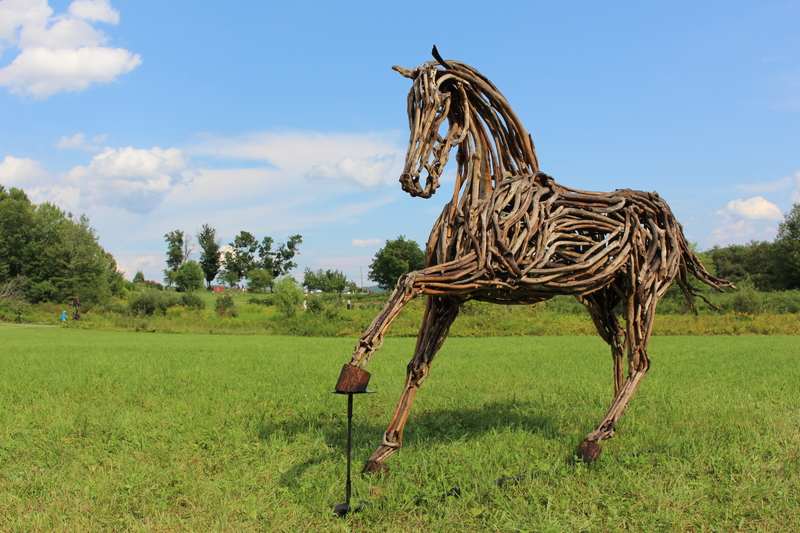 There will be handmade items by artisans and crafters in many media, wagon rides, and a playground. The fair will have music by Bad Tickers and craft beer by Rapscallion Brewery. 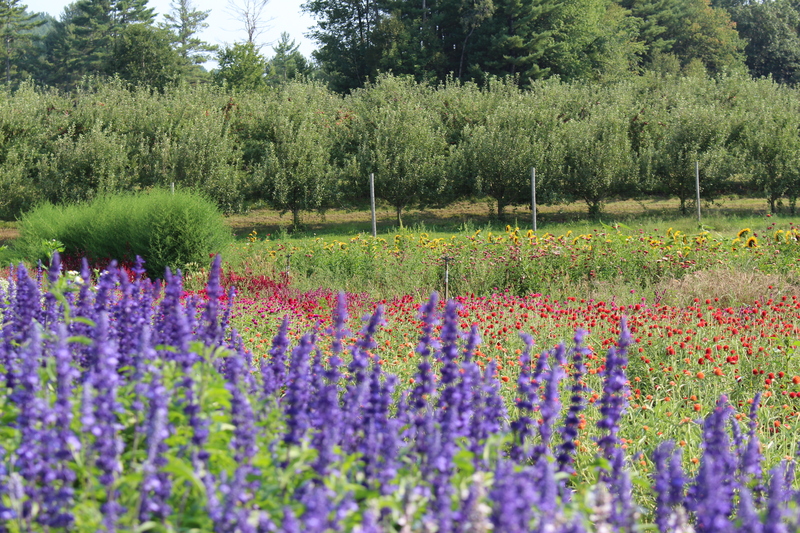 The orchard is located at 12 Lincoln Road, North Brookfield, Massachusetts. For details, call 508-867-6858 or email brookfieldo@aol.com. NEW HAMPSHIRE Gov. 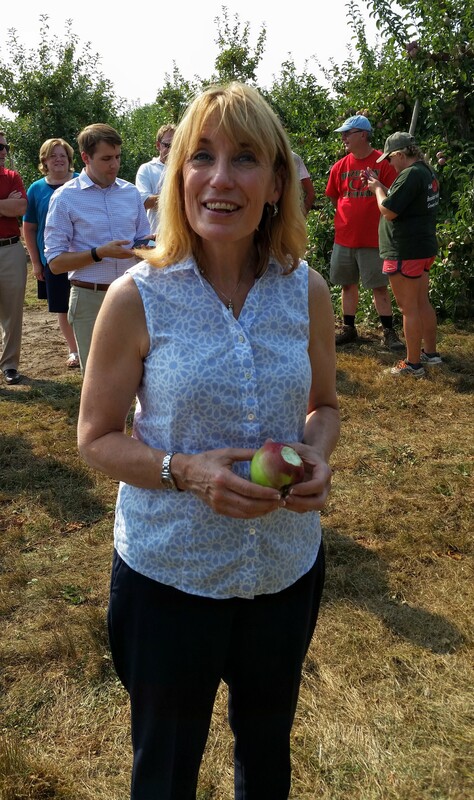 Maggie Hassan, Rhode Island Chief of Agriculture Ken Ayars, Massachusetts Commissioner of Agriculture John Lebeaux, Massachusetts State Senator James Eldridge, and Jim Bair, president of USApple, were among the officials visiting orchards Wednesday and Thursday to officially launch the 2015 New England apple harvest. 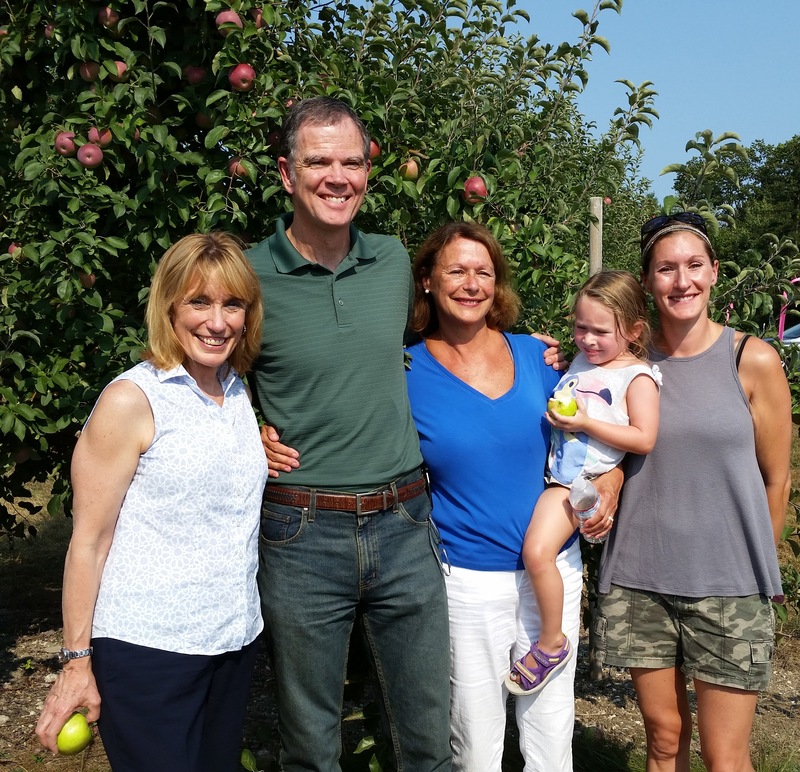 Many varieties of apples will be available for picking this Labor Day Weekend, including McIntosh, Gala, and Cortland at a number of orchards. Ripening times vary from orchard to orchard, so always call ahead to find out what is available. 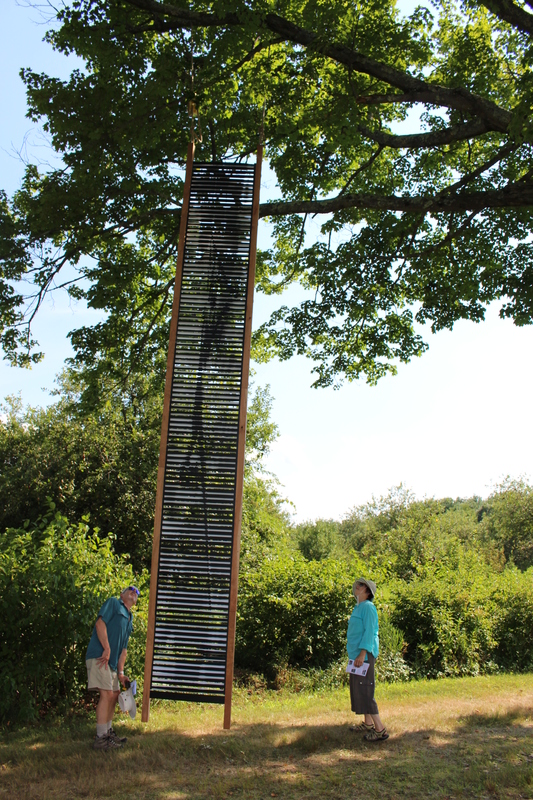 Here are a few scenes from New England Apple Day from around the region. 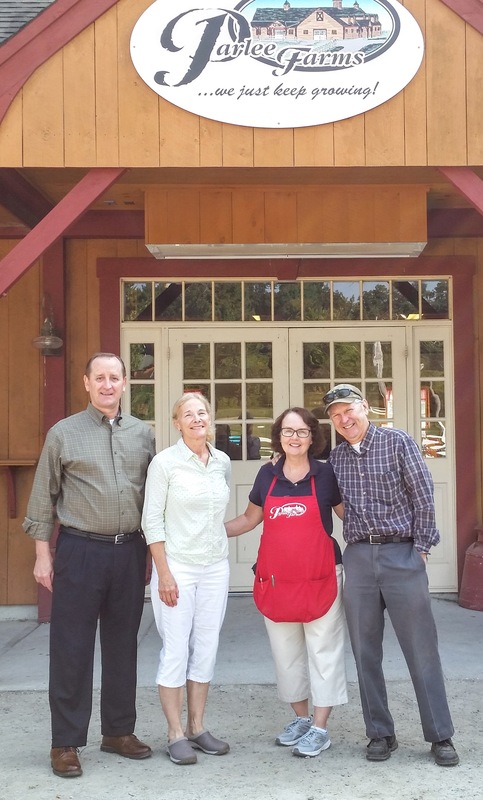 L to R: Jim Bair, president of USApple, Bar Lois Weeks, executive director of the New England Apple Association, and Ellen and Mark Parlee pf Parlee Farms in Tyngsboro, Massachusetts. 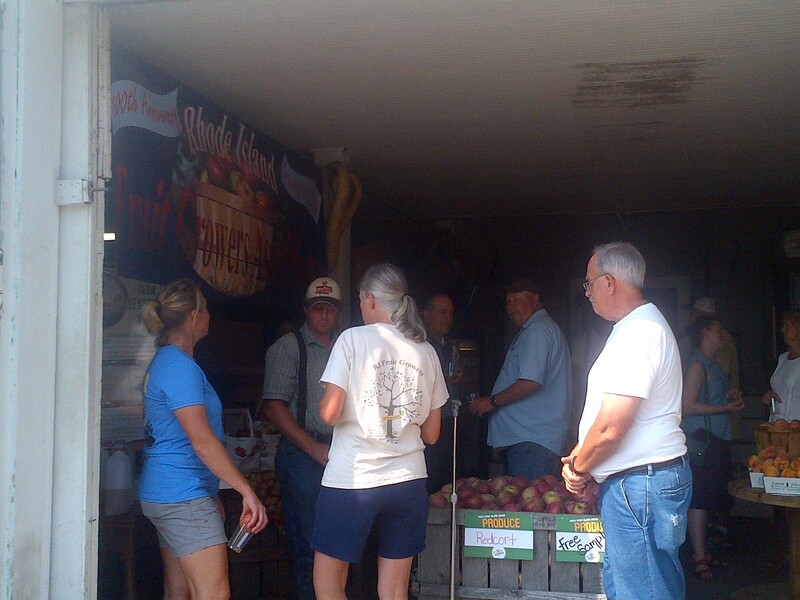 Rhode Island Chief of Agriculture Ken Ayars took this photo of the crowd gathered at Steere Orchard in Greenville.